Rooms with refined decor and views to the mountain. From Monday 1 July 2019 until Saturday 31 August 2019: Enjoy 20 % off! From Friday 21 December 2018 until Tuesday 21 December 2038: Enjoy 15 % off! Spacious and elegant, this room offers magnificent views to the old Medina. Luxury suite with bedroom, living room, bathroom with Jacuzzi and balcony. 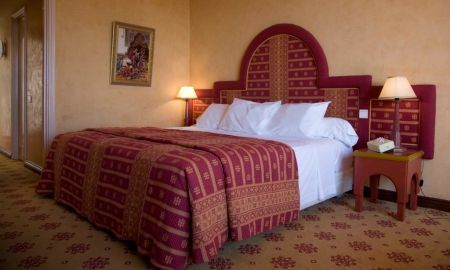 An island of calm and serenity, Les Mérinides is a luxurious hotel situated on the edge of Fes, Imperial City declared as world heritage, with interiors decorated in traditional Moroccan style with marble lobby, carved plaster ceiling, mosaics, and central fountain. 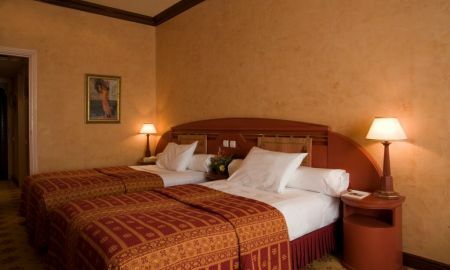 The rooms and suites combine modern and traditional style, with breathtaking views to the old Medina and all the services you need for a memorable stay in the spiritual capital. The restaurants offer exquisite pleasures and Moroccan specialties at “La Kouba du ciel” with Andalusian orchestra each night and sweeping views to the Medina, European cuisine at "L’Impérial" and grilling and salad specialities at "La Terrasse de Fès”. After a copious meal, join the hotel’s bar to enjoy your favourite drink in a relaxed atmosphere. 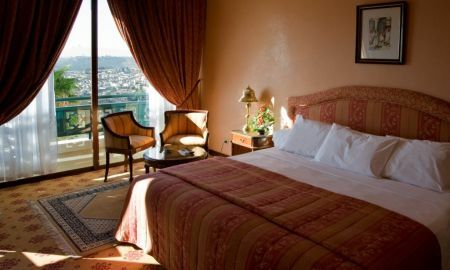 Les Mérinides hotel overlooks the old city of Fes (Medina), 2 minutes from the Museum of Weapons and 5mn from Bab Boujloud (the entrance of the Medina).